Oof. That's all I can say post-Thanksgiving. Too much food, too much wine, too many slices of leftover pumpkin pie for breakfast. Don't get me wrong, I love I looove pie for breakfast but it's all a bit much. 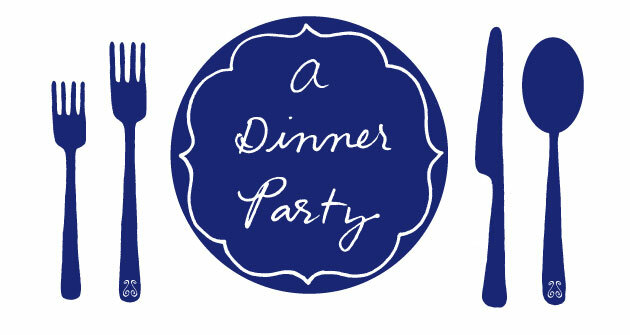 Fullness aside, what I love most about Thanksgiving is the potluck nature of dinner. In my family everyone contributes something (well, at least the women do). Some dishes, like my Nanny's cranberry sauce, are things I've been eating as long as I can remember. Others, like my roasted brussels sprouts, are newer additions to the table. And now that Dan and I have combined our families for the holiday, we've got even more food to be thankful for--like a perfectly roasted turkey with gluten-free stuffing courtesy of my mother-in-law. While it seems a bit strange to share Thanksgiving recipes with you after the fact, these side dishes would be great for Christmas or any other dinner party. Oh, I hated brussels sprouts as a kid. Hated them. Had to sit at the dinner table long after everyone had finished because I wouldn't eat my vegetables. Even though I was being sort of a brat, my six-year-old palate wasn't too far off. When boiled, brussels sprouts turn into sour little stink bombs. But a few years ago, brussels sprouts started popping up on menus in restaurants I liked. So I tried to get over my childhood paranoia and roasted them with bacon and lemon as instructed from this recipe from BA. 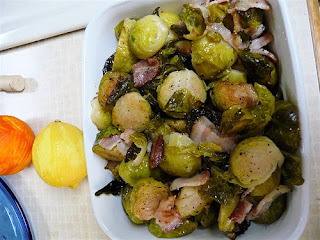 The effect was completely different: the sprouts were caramelized, slightly sweet, and deliciously smoky from a generous portion of bacon. In short, delicious. These will convert the most brussels sprouts scarred person. Preheat oven to 400 degrees. Cook brussels sprouts in medium saucepan of boiling salted water until crisp-tender, about 5 minutes. Drain. Spread brussels sprouts on rimmed baking sheet in single layer. Sprinkle with bacon, lemon zest, juice, salt, and pepper; stir. Roast brussels sprouts until tender and beginning to brown, stirring every 10 minutes, about 30 minutes. Transfer to bowl and serve. This what I always ask for around the holidays. 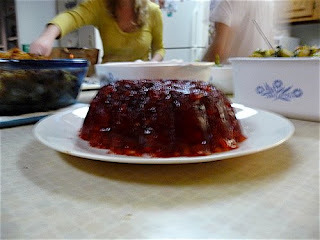 Yes, it's a Jell-O mold, but it's been one of my favorite Thanksgiving dishes since I was a kid. Call it comfort food. Unlike modern cranberry sauces with ingredients like orange zest and spicy peppers and triple sec, this version is very 1950's in its jiggly, walnut-studded, pineapple-filled glory. I usually eat it straight out of the Tupperware the next day. In a medium-sized bowl, combine hot water and the can of cranberry sauce. Stir until the sauce is fairly broken down. Add the Jell-O powder and stir until combined. Stir in the pineapple and walnuts. Pour into a plastic mold (or serving bowl) and refrigerate overnight. I still love the canned cranberry sauce that comes out in one big cylinder with the rings from the can still on it. There's just something about a big, burgundy slice of jelly on my plate that warms my heart. So I understand your fondness for 50's style cranberry sauce. Life doesn't have to be all anise and filbert and cardamom. Sometimes, jell-o and walnuts is what you want. I don't even know what filbert is, but I want it--in pudding pop form if possible. A filbert is a Brazil nut, dear Daniel. It would probably make a pretty good pudding pop. Also, I can't believe there isn't already a website devoted to the awesome, bizarre non-words that your verification engine comes up with. What's a 'toemer'? Is it a toe tumor? What about a 'cablesma'? I'm so fond of these things. I agree with Megan, Life doesn't have to be all anise and filbert and cardamom. Or 'yardarm'. A filbert is actually a hazelnut. Anonymous is right! All my life I've been calling them brazil nuts. I'm not sure the comments section of your blog is the appropriate place to ask, but I'm seeking guidance. I'm throwing a holiday party for probably about 25 guests--the first time I've had that many people over since red cups and a keg were the name of the game. So my question is this: When entertaining that many people for cocktails in your home, how do you manage to stay out of the kitchen the whole time? For a specific example: If you want to serve a fancy signature cocktail, how do you keep from mixing up new batches every 15 minutes, which would prohibit you from having any real conversations? I'm thinking a punch bowl full of egg nog, or some other single holiday-ish drink. Is this gauche? Plus of course lots of wine and other, easier things, and of course, lots of graze-able hors d'oeuvres and crudites all around the house as well. Anyway, what say you? Maybe this can inspire a post. I have to know: cook the bacon before you throw it in with sprouts to roast, or dice and sprinkle on raw (and then roast, of course)? Because you just blew my mind with this one. Lil Miss Dubin: a post is coming especially for you. Tommy: you throw the bacon in uncooked. It roasts with the brussels sprouts, perfuming them with porky goodness. It's nice to see our haiku throwdown inspire new creations. I love the haiku post! Next time, for me, would you write three lines in parentheses that address what Claudia and Bitty are undoubtedly doing when the cameras are, ahem, off?